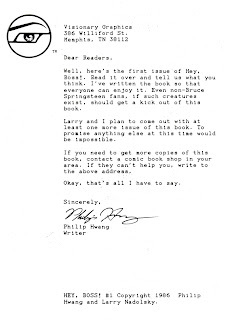 "Even non-Bruce Springsteen fans, if such creatures exist, should get a kick out of this book," - Philip Hwang, writer and creator of Hey, Boss!, in his introduction to the first and only issue of that series, Hey Boss! #1 (Visionary Graphics, Issue Date: 1986). Time was, the image of Bruce Springsteen standing before an American flag was ubiquitous, as were parodies thereof. The Born in the U.S.A. album had been released in the summer of 1984 and ultimately achieved the feat of seven top ten singles throughout 1984 and 1985. 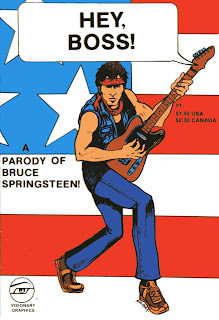 In 1986, seeking to honor Springsteen and perhaps capitalize upon his success, 19 year old Memphis, Tennessee based writer Philip Hwang and Canadian artist Larry Nadolsky created Hey, Boss!, an independently published black and white comic book featuring parodies of Springsteen. Thanks to a fan in Memphis, Bruce Springsteen will "tour" the country in late October. 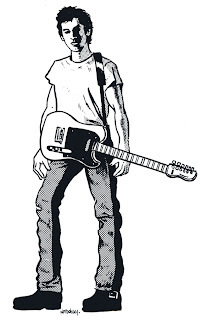 Philip Hwang , a "hard-core" fan, has written "Hey, Boss," a comic book that parodies some events in Bruce's life circa 1972 when he was an emerging rock star. 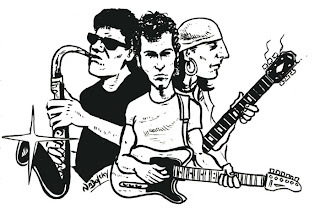 But Springsteen and band-mates Clarence Clemons and Miami Steve Van Zandt won't be identified by name because the author didn't get permission (they'll be called Boss, Big Chief and Miami, respectively). 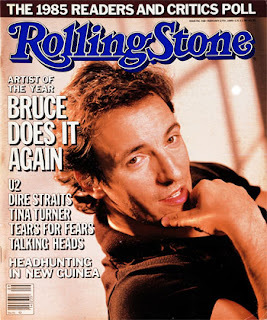 Above: Springsteen on the cover of the February 27, 1986 issue of Rolling Stone. 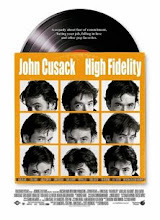 The four vignettes are "The Motel" (in which Springsteen and his entourage, including Clemons, check into a fleabag motel, flee from cockroaches, and then find two women at a local bar with whom to stay), "The Binkers" (in which Springsteen and Clemons dine with Archie and Edith "Binker" in an "All in the Family" parody), "The Rogue Gallery" (which features fictional former bandmates who conform to certain rock stereotypes), and "They Call Him Bruce" (chronicling another series of misadventures featuring Springsteen and Clemons). The experience was to be a stepping stone for its creators. 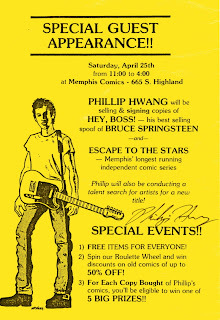 Hwang told the Memphis Commercial Appeal in late 1986 that he was "hoping to become a professional comic-book writer some day" and to do that "you've got to do something spectacular inside the comic world that everybody knows about. "3 Featured on MTV News, the book would sell out its initial printing of 10,000.2 Hwang and Nadolksy were on their way to success. Twenty one years ago, Bruce Springsteen was one of the hottest music talents around. I was a teenager who had finished a moderately successful comic book series called Escape To The Stars. I think I was breaking even, but my collaborator James Lyle wanted to take the project in a different direction. So that series stopped at issue five. I still had the desire to produce comic books , and Springsteen was someone I admired very much. His early works really connected with me. Many of them such as "Born To Run," "Thunder Road," and "Hungry Heart" have the romantic theme of leaving your stagnant home to a more dynamic place. I guess a lot of teenagers probably feel the same way. In addition to connecting with Springsteen's music, Bruce had a persona that was different from the stereotypical hedonistic rock star. He was known for telling little stories during his concerts that really gave you insight into the man. I heard many of these stories on bootleg cassettes. So I took Bruce's concert persona one step further. I also wanted to reach an audience beyond the typical comic book reader and felt that a comic book about Bruce could be sold in record shops and mainstream book stores. Above: The last panels of "The Binkers," from Hey, Boss! #1. My sole contributions to "Hey Boss" were the Visionary Graphics logo that appears on the cover and turning Philip down flat when he offered me the job of drawing it. He developed the script and pitched the idea to me. I turned him down flatly simply because I was still pretty steamed about how things had worked out on ETTS. What I told him at the time was that I felt it was a "one joke book" (referring to the "Springstine" gag, copped from Joe Piscopo on SNL) and that I wasn't interested. To be honest, I never expected it to get off the ground. I underestimated Philip's drive to succeed. The first issue arrived in 1986, although a planned second issue never materialized, in part due to fears of a possible lawsuit. (It was to feature Springsteen's attempt to break into Graceland.4). Although no legal representative of Springsteen ever contacted Hwang, the potential threat of litigation, coupled with some other issues, ended the series. "It was a combination of the fear of being sued and not being paid by the distributors for the first issue," writes Hwang. "Also, I was artistically moving away from comic books." I also recall the day a coworker walked in with the local paper (The Winnipeg Free Press) that had a large picture of Bruce Springsteen and a story on how we were going to get sued. Nothing happened, I guess we were too small potatoes. Nadolsky feels the issue has a broad legacy. "I guess it could be considered a important book for the fact that it inspired Todd Loren to create Rock N' Roll Comics and led to me working on a lot of those books," recalls Nadolsky, who drew the first issue (which profiled Guns N' Roses) and many others in that series. (Loren's creation of that notable series, along with his unsolved 1992 murder, are the subject of the 2005 documentary, Unauthorized and Proud of It: Todd Loren's Rock N' Roll Comics. See also here for a MySpace blog entry from that film's site supporting the Loren connection.). Hwang (who runs a carpet cleaning business when not producing independent films) isn't quite certain what to think about his creation of Hey, Boss! twenty one years ago. "Looking back, I am a bit embarrassed that I felt so strongly about an entertainment figure that I would go to the trouble of making a comic book about him," writes Hwang. "On the other hand, it is a great conversation piece that was harmless and hopefully a little amusing." 1. Perez, Daniel. "Section: Calendar, Boss Book," Los Angeles Times, October 5, 1986. 2. John Beifuss, "Hopes hang on superheroes: Comic Book creators view task as serious business," The Commercial Appeal (Memphis, TN), December 29, 1986. Nice article, glad to have been included therein. I should point out that even though I was "Steamed about how things worked out on ETTS" that at that time I was pretty much steamed about everything! So again, not Phil's fault. BTW, thanks for putting Phil and I back in touch. Nice to catch up with him after all this time. Todd collected music memorabilia with comic book tie-ins, from the Electric Comic Book album to the Spider-Man RokComic album and a bunch of other stuff. He was also running a comic book mail order biz similar to Musicade, called Comic-Cade - some of Comic-Cade's most steady sellers were the two old Marvel Kiss comic books and an unauthorized Beatles comic mag that Marvel once put out, plus the old Gold Key Yellow Submarine comic. Todd bought any and all copies of these items that he could find and sold them at a good markup. He closed Comic-Cade first, selling off the entire inventory right around when he began plotting his own comic line, Rock 'N' Roll Comics. There were copies of the aforementioned comics and others in his office, including copies of Hey Boss. 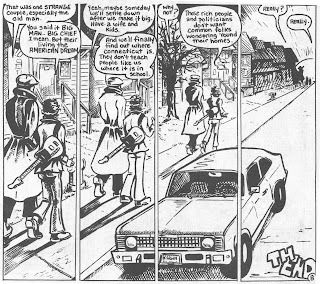 I think Todd would have planned "spoof" stories in his rock comics even had he not seen Hey Boss - Todd was a huge Mad fan and in fact had submitted material to Mad as a teen and gotten a personal letter of encouragement from publisher Bill Gaines - but Hey Boss was a big part of his inspiration for the backup stories. I'm not sure when Todd first contacted Hey Boss artist Larry Nadolsky in Canada, but it was early in the game. Larry quickly became a regular contributor to Rock 'N' Roll Comics. He also co-created the Stan Back filler strips with Todd, tho they later had a falling out over this and other artists drew a few Stan Back comic strips. They eventually mended fences and RevCom even released a one-shot Stan Back comic book, while Larry continued to contribute to the rock comics, up to and beyond Todd's death in 1992. Larry also drew for the Carnal Comics spinoff series well into the late '90s. About a year ago, I talked with Larry for the first time in years. He's been doing work for bands, as well as a comic book called Depositman co-created by Carey Coatney. The Stan Back comic strip continued to run new editions in a Connecticut entertainment monthly called Soundwaves, a mag I was writing for. I think Larry once told me he had a major falling out with the guy who published Hey Boss. An interesting aside - when RevCom/Rock 'N' Roll Comics closed down and I obtained the Carnal Comics rights, we named the company Re-Visionary Press, mainly so our ads would remain listed in the same sections of wholesale distribution catalogs as RevCom (the big catalogs list publishers alphabetically). We were hoping stores would continue to order the same quantities as they had with the RevComics, plus my partner Heather Dawn and I had some cool ideas about Re-Visionary logos, with eyeballs incorporated. I was asked by Larry to ink a Stan Back gag, and it led to my inking the main stories on R and R #2, Metallica, and #3, Bon Jovi. It was a great ride, Larry's the best, and Todd was a very nice guy.